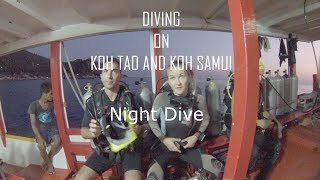 Most divers who take a course PADI Advanced Open Water Diver in the Scuba Birds center in Koh Tao choose the night dive as part of this program. The depth varies from 5 to 18 meters. Not all divers feel confident on the first night dive, so you can always choose the individual program and the most suitable route. For example, a sand zone without sea urchins and sharp corals. Night dive is a perfect test of your buoyancy and stability. During the night dive, you can meet stingrays that are actively looking for food, giant groupers hunting for smaller fish, hermit crabs, moray eels, pufferfish, sleeping triggers, shrimps and even turtles. Each diver gets one main and spare flashlight. Before diving, you will have a briefing with your PADI Instructor on signals, diving techniques, marine life and potential hazards. If you are a PADI Open Water Diver, then you can take one Adventure Night Dive. Explore the various dive sites of Koh Tao and get the most of it!